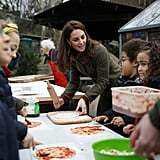 Kate Middleton made her first royal engagement of 2019 when she stopped by the King Henry's Walk Community Garden in Islington, London. 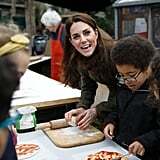 The duchess seemed totally in her element as she spent the morning with a group of cute kids doing some gardening, building birdhouses, and making pizza in the great outdoors. 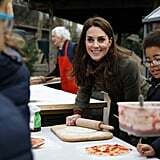 Kate was adorably chatty with the children, and while rolling dough and talking about toppings, an 8-year-old girl named Nadirah decided to get to the bottom of things and ask a hard-hitting question: "Has the queen ever had pizza?" In a sweet Instagram video shared by People's Simon Perry, Kate looked nearly stumped and even paused for a moment before saying, "You know, that's such a good question. I don't know!" She added, "Maybe next time I see her, shall I ask?" I hadn't considered it before, but thanks to Nadirah, I am now dying to know! While we wait for Kate to follow up with the answer, we'll just appreciate the fact that Queen Elizabeth II is a confirmed chocoholic, loves her tea, and enjoys a cocktail (or six) every day.